Taste & Create time, and I seem to be firmly stuck in the risotto groove. My partner this month is Cuisine Heart, and after browsing her blog I found several recipes to interest me. 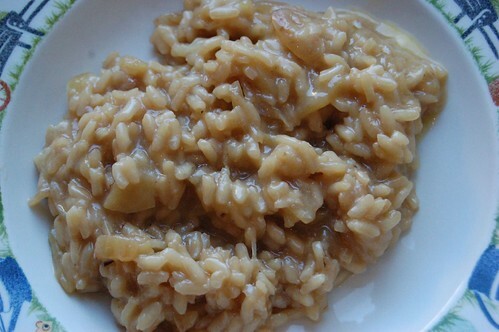 After the fabulous pear and gorgonzola risotto, I was tempted by her caramelized apple, onion and cheese risotto. Also I was running out of time, and it was easy and quick to do, using ingredients from the storecupboard. It’s basically a standard risotto method, except that you caramelize the apples and onions instead of just gently softening them in the oil, and use dry cider instead of white wine. Verdict: OK, it is not up to pear and gorgonzola standards, but it was delicious and unusual. The only cheese I had was a stub of Comté and lots of parmesan, so I made do with those and didn’t add cream at the end. I loved the tart fruitiness of the cider and apple. We ate it on its own, but it would be nice as an accompaniment to roast pork. The photo is just further proof of how unphotogenic risotto is. Goodness! One of my favorite recipes, I’m glad you chose it! I feel terrible however, that I will not be able to post a return entry in time for the deadline–my first time participating and I fail! But things have suddenly gotten very busy and I didn’t check my blog e-mail in time to prepare beforehand. However, I will do so in the upcoming weeks. Your blog looks wonderful and I can’t wait to dig in. Again, sincerest apologies and I’ll let you know as soon as I can post.